Of all the deals we’ve covered this week, one in particular has really managed to stir up some buzz. 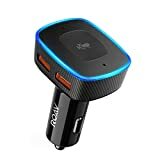 It’s Amazon’s current sale on the Roav VIVA by Anker, a tiny gadget that looks like a regular old car charger adapter. It’s so much more, however; it’s basically an Echo Dot for your car. This nifty device links to your smartphone for connectivity and puts all of Alexa’s power at your fingertips while you drive. Ask Alexa questions, order stuff on Amazon or add things to your wish list, or stream some music while you drive. It’s an awesome device, and it’s currently on sale at its lowest price ever — but only for a couple more days, so grab one while you can.